Can you believe it? It is February already! I am not one to get excited about the month of love and hearts, but I am trying my best to embrace it this year and what better way to do that then starting off with a little Currently Linky from Farley at Oh' Boy 4th Grade! It is eerily quiet at my house. It has been that way all week due to me being home four days for snow. But, I actually REALLY enjoy days off. Don't get me wrong.....I get a little stir crazy, but the time off is nice. I wear myself out teaching because it gets my 110% effort and attention all the time so it is nice to have some unexpected vacation days to recharge! 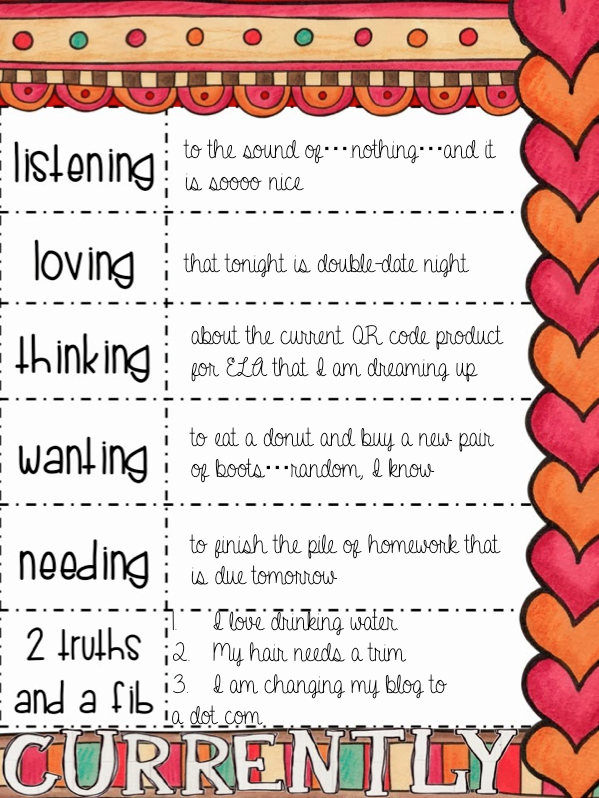 I have a zillion ideas floating around in my head for things to create and post on TPT from ELA QR activities to Valentine writing center templates to testing prep. I..need...more..hours...in..the...day folks!!!!! I seriously have a pile of grad school work that I need to finish as well. I work on that all the time yet seem to get nowhere. Maybe THAT is what I should have done on my break this week...nah! This one made me LOL when I typed it out, but it's the truth! I really want a doughnut. Today is my cheat day so I will probably talk the boyfriend into making a coffee and doughnut run. I also really want a new pair of low cut, ankle boots. Ohhh and a new oversized Aztec sweater. It's an obsession really, and I have no idea where it materialized from (probably an outfit picture on Pinterest). Ooops, I kinda answered this one under thinking. But seriously, homework is a must this weekend. I may have made these too easy, and maybe I shouldn't be telling you which ones are truths and which ones are fibs, but I am dying to spread the word about an app that many have been posting on our Facebook Teacher Fitness page, #teacherfit. So truth numero uno is that my hair needs a cut, BAD! It is convenient that one of my teacher friends at my school cuts hair. Guess I need to find her this week and set something up. The second truth is that this little blog is going to be getting some major professional help in the near future. I am get a real blog design(finally), and I will be changing to a dot.com. I am pretty excited!! Now for the fib. I hate water. It just has no taste. We are clean eating here at the house which means that even putting the flavor packets in the water or adding fruit is a NO WAY. So, I am having to drink water PLAIN!!!! Oh my goodness. Na-has-ty! It is hard work getting the water intake I need when I despise the taste so much. 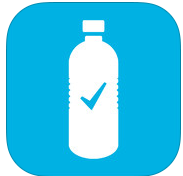 So, I am tracking the water I drink with the app Waterlogged. It is easy to use, and it is free. It has really helped me make sure that I am drinking enough water, and I am such a visual person so seeing the little water bottle fill up throughout the day is a great motivator for me! So..there is my February currently. Lots of love to all my blogger friends and followers! I am with you on the water. I don't like it either. I can only drink it from a straw and it has to be ICE cold. I will go check out that app. I need some help or motivation to drink more water and get fit. Thanks for sharing. OMG.....I hate drinking water too!! It totally makes me gag!! I am one dehydrated prune most of the time!! I wish I could be one of the cool people who are always slinging a bottle of water around!! Ha ha!! Have a fabulous double date!! I didn't know there was an app to track your water consumption! That's awesome. I will have to look into that. Have fun on your double date and good luck with your future blog endeavors! A new blog design & a .com? WOOHOO! I can't wait to see it! Who are you getting to redesign?